Editor's Note: In the time since this story was first published, John McBride has taken a new position as senior prospect research analyst at Loyola University Chicago. According to his colleagues, McBride personifies this University of Chicago approach, and it is his leadership within the team and the larger organization that made his nomination stand out. “John’s deep experience in prospect research as an analyst and team supervisor — and his willingness to step outside the role of the ‘traditional’ prospect researcher to establish meetings with leadership to discuss the importance of mega-gifts and outlining how mega-donors can and should be approached — has been instrumental to alumni relations and development,” wrote nominator Marcus Smith, who is on McBride’s team at Chicago. The Apra Professional of the Year Award recognizes a prospect professional who has had a significant positive impact on his or her organization’s success in fulfilling its mission. It recognizes the skills, talents and accomplishments of an individual who has gone above and beyond the scope of their core duties and played a leadership role in their organization. The awardee receives a complimentary conference registration and accommodation. During his seven-year tenure at the University of Chicago, McBride has learned to be a strong advocate for his work, his team and the profession. “We are talking to our gift officers all the time. We regularly make presentations to them exactly like the one we did here at the conference on venture capital and private equity,” he said, referencing a session he jointly led with colleague Amelia Aldred. McBride urged his colleagues in prospect development to become more proactive in everything they do. 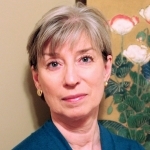 Susan H. Faraone is a senior consultant for Aspen Leadership Group. She serves as the editor of Connections and the chair of Apra’s editorial advisory committee.